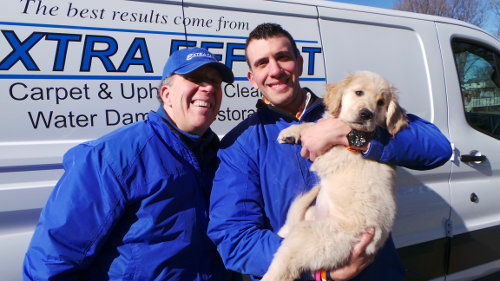 Extra Effort Carpet & Upholstery Cleaning, Inc. is a father and son owned and operated business. Elliott S. Fishman started the West Chester, Ohio based company in 1984 with the belief that it takes Extra Effort to make each job a success. Elliott has maintained a “hands on approach to business”. This insures that his clients and their homes and offices are always treated in a professional, courteous and respectful manner. Upon his graduation from Miami University, Elliott’s son Brian joined the company, thus insuring that their pledge to give Extra Effort in the fields of carpet cleaning, upholstery cleaning, water damage/water extraction, odor control and fabric protection continues with a second generation. Extra Effort Carpet and Upholstery Cleaning, Inc. is proud to serve the residents and businesses of Greater Cincinnati, Ohio, Hyde Park, Ohio, Fairfield, Ohio, Springdale, Ohio, Mason, Ohio, West Chester, Ohio and Northern Kentucky.